With only five Thursdays left in 2012 it's time to count down my five favorite photos taken by me in 2012. These aren't the blog's most popular photos (which you can see on the right side), but are the photos that I enjoyed taking, working on, and looking at the most. The order picked is random, so today's shot is not the least-favorite or the most favorite shot of 2012. 2012 saw me finally trying my hand at some infrared photography. I had seen it online first many years ago and really liked the surreal look it gave off, especially in the faux color area. With this shot I had originally meant for it to be a faux color shot (see original post here) but in the process of writing that entry I did a very quick black & white conversion and find I like this look better. Infrared and black & white allow me to relax about certain aspects of photography. I don't feel the need to attack a photo and rid it of every piece of noise in a black & white shot. In fact I find myself adding grain. 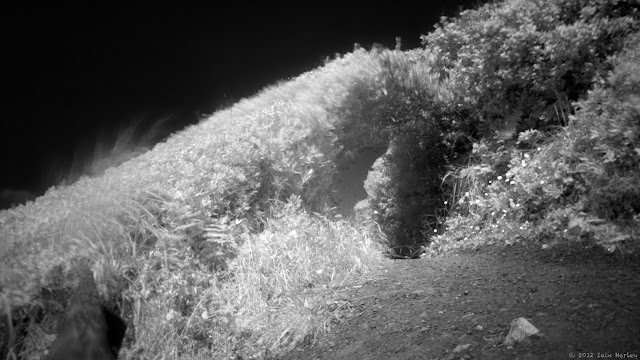 Infrared, since we're already taking out the visible light spectrum, frees me from trying to replicate what I saw and to be a little more artistic about the finished shot. The shot is surprisingly noise free, but the long shutter speed allows a lot more movement in the shot that I normally wouldn't tolerate. I love the glowing bushes against the middle of the day sky. Okay, it's not really a book, more of an author. An author I discovered while browsing my Google+ feed. Someone on my feed called him the next Michael Crichton. Now I thoroughly enjoyed Crichton's books so I thought I'd give Daemon a shot. Having been so completely sucked into that world I was quickly finding myself into the second book of the two part series, Freedom and very much enjoying it. Though very sci-fi-y, the series brings up some good questions about government and business. Daemon looks to be coming out as a movie, with no release date yet, and I assume if it does well Freedom won't be far behind. Kill Decision is a slightly less sci-fi feel of a book, more of a techno-thriller dealing with today's favorite talked about piece of army technology, the drone. This feels a lot more Crichton like with the merging of cutting edge 21st century tech and the complex organization of an ant colony. I was a little dubious about this at first, but it quickly made sense and made for another fast page turner that I was sorry to put down at the end. 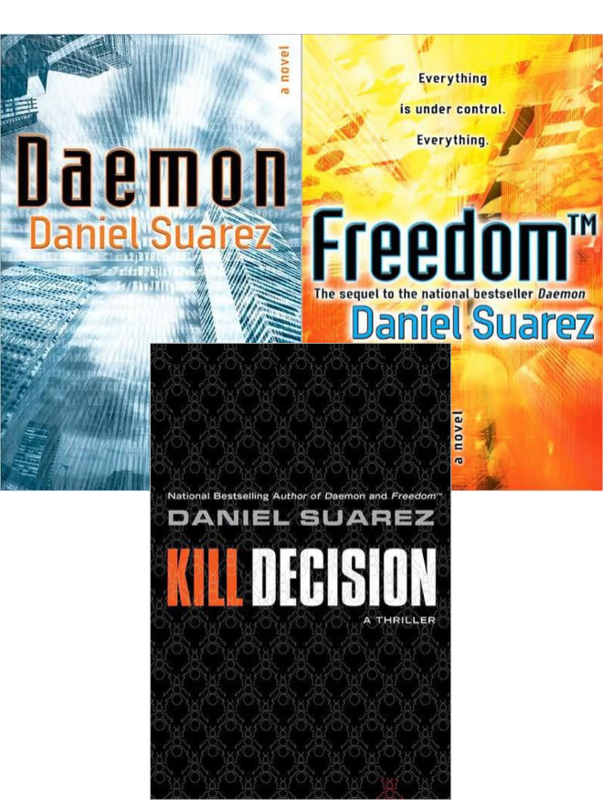 I hope I won't have to wait too long for a new Daniel Suarez book. You can find more information about him and his books here.